Description from GoodReads: The life and famous words, such as "it ain't over till it's over," of Major League Baseball player and New York Yankee Lawrence "Yogi" Berra are celebrated in this nonfiction picture book. Yogi Berra loved his family, his neighborhood, his friends, and, most of all, baseball. He was crazy for it, ever since he was a young kid playing with friends in an abandoned dump. But baseball didn't love him back--at least not at first. Yogi was different. He didn't have the right look. When he finally made it to the major leagues, Yogi faced pranks and harassment from players, sportswriters, and fans. Their words hurt, but they made Yogi determined to show all that he could do. This book looks at the talents, loves, and inspirational words of this celebrated New York Yankee and American icon, who earned a World Series ring for each finger and made baseball love him back. Have you noticed that there are dozens of baseball picture books? Many are picture book biographies. A few years ago, I did a blog post of my favorite baseball picture books. In following years, I updated those lists. Along the way, it dawned on my me to ask where were the football or basketball or soccer picture books? After a search, I discovered that there was definitely a preponderance of baseball books. And frankly, that is okay with me. One of the latest baseball picture book biographies puts the spotlight on Yogi Berra. As a child, I grew up with equal parts Boston Red Sox and New York Yankees. My father was (still is) a Red Sox fan. I was a Yankees fan. During those years, I knew of Berra more as a coach than a player. He was almost a cartoonish character with his short thick stature and Yogi-isms. And for as much as I knew of him, I knew little about him. Rosenstock’s picture book biography on Yogi Berra filled in lots of the gaps for me and gave me a new appreciation for the man and the baseball player. As I read the book, I found myself getting emotional. Emotional over how Berra was treated, and how hard he had to work to realize his dreams. Somewhere along the line, I found my admiration of Berra growing. Widener’s illustrations paired beautifully with Rosenstock’s text and made this a a complete package. If you are a fan of baseball and picture book biographies, you will want to add this to your collection. Rosenstock includes an author’s note, bibliography, career statistics and information on his “Yogi-isms”. Also there is an Educator’s Guide on the Boyds Mills Press website (link above). Pick up a copy of this book at your local indie bookstore or community library. About the author: Barb Rosenstock is best known for her many picture book biographies, including Thomas Jefferson Builds a Library, Ben Franklin's Big Splash, The Streak, Dorothea's Eyes, and Blue Grass Boy, all published by Calkins Creek. 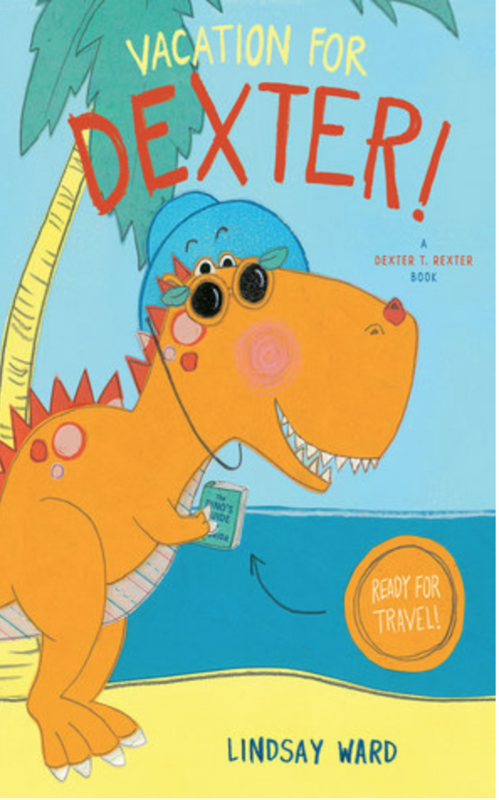 Her other recent titles include a picture book about Vincent Van Gogh, Vincent Can't Sleep, and a picture book about Vasily Kandinsky, The Noisy Paint Box, which won the 2015 Caldecott Honor Medal. She lives outside Chicago with her family. Visit her at barbrosenstock.com. About the illustrator: Terry Widener is the award-winning illustrator of many picture books on athletes, including The Streak: How Joe DiMaggio Became America's Hero, Girl Wonder: A Baseball Story in Nine Innings, American Champion Swimmer: Gertrude Ederle, and Lou Gehrig, The Luckiest Man. He is also the illustrator of The Kite That Bridged Two Nations by Alexis O'Neill. He lives in McKinney, Texas, with his wife and is the father of three grown children. Visit him at terrywidenerart.com. 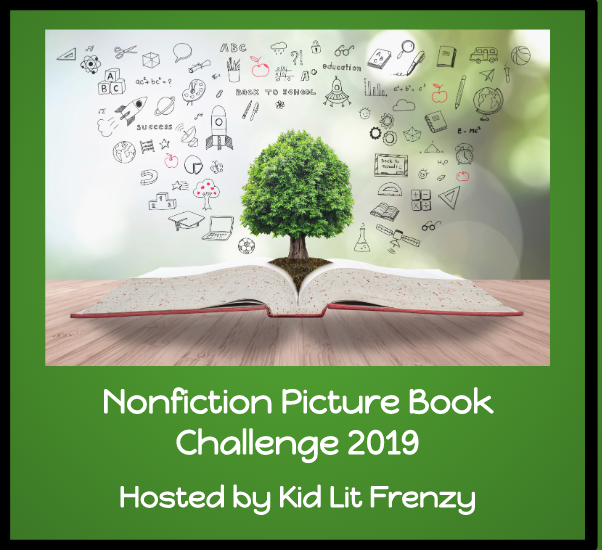 Don’t forget to link up your nonfiction reviews below…. Recently, I had a conversation about poetry with a colleague. She was prepping a professional development on poetry for the teachers we work with. As she was prepping, she read from some of the poetry her former students had written. It was simply beautiful. While we talked, I shared about my struggle with poetry and how I had avoided it for so many years. I finally decided that I needed to find and read some poetry for children and not just the work of Shel Silverstein or Jack Prelutsky. My journey lead me to the work of so many incredible poets, including the work of Laura Purdie Salas. I love how Laura’s poetry is so accessible. I am excited that so much of her work connects poetry to nonfiction. In one of her latest book (yes, she had three new titles), IN THE MIDDLE OF THE NIGHT: POEMS FROM A WIDE-AWAKE HOUSE, Laura brings to life the world of talented stuffed animals, markers without their lids, toothpaste and dental floss, a conversation between flip flops and winter boots, and more. I never really thought about all of the things that could come awake at night while the human occupants are fast asleep. To match Purdie Salas’ delightful and entertaining poems, Angela Matteson uses color and playfulness in her illustrations that perfectly match the text and take it all one step further. IN THE MIDDLE OF THE NIGHT is a humorous read aloud perfect for bedtime or for the classroom. Pick up a copy at your local indie bookstore just in time for National Poetry month. About the author: Laura Purdie Salas is the author of more than 125 books for children, including If You Were the Moon, the award winning Can Be . . . series, and BookSpeak! Poems About Books, which was an NCTE Notable Book of Poetry and won the Nerdy Book Award for Poetry, among other honors. She lives with her family in Plymouth, Minnesota. Visit her at laurasalas.com. About the illustrator: Angela Matteson is the illustrator of Grumbles from the Town by Jane Yolen and Rebecca Kai Dotlich. She works as a Marketing Director and food packaging designer. She enjoys showing her paintings in galleries and lives in Columbus, Ohio. Visit her at angelamattesonart.com. If sharing about the blog tour, please include the following Twitter handles: @boydsmillspress, Laura’s handle on Twitter is @LauraPSalas and Angela’s is @angelamatteson. The hashtag for the blog tour is #WideAwakePoems. "Isabella Bird was like a wild vine stuck in a too-small pot. She needed more room. She had to get out. She had to explore." Exploring was easier said than done in Victorian England. But Isabella persisted, and with each journey, she breathed in new ways to see and describe everything around her. Question by question, word by word, Isabella bloomed. First, out in the English countryside. Then, off to America and Canada. And eventually, around the world, to Africa, Asia, Australia, and more. This dashing picture book biography about the first female member of the Royal Geographic Society takes readers around the world with a daring nineteenth-century female explorer and author. Kristy Caldwell's detailed illustrations illuminate Bird's travels around the world, and Lori Mortensen's back matter, author's note, and bibliography will satisfy the curiosity of readers who want to learn more. Most of the time, when I think about what it would be like to live during a different time period, I think about the lack of indoor plumbing and how women were treated and decide I am okay with living in my current time period. Despite my own lack of interest in traveling and living in past centuries, I can certainly appreciate how difficult it must have been for women. And yet, there are women who stepped out of traditional roles and left their stamp on the world in phenomenal ways. Isabella Bird was one of those women. Based on the advice of a doctor, as a treatment option for her health challenges, Bird began with fresh air and walks which eventually led her to travel around the world and write about her travel experiences. In my twenties, I moved from Massachusetts to California. A friend and I drove across the country and I remember thinking what it must have been like for pioneers traveling by foot and in covered wagons. As I traveled, I had the benefit of books, photographs, and other experiences to prepare me for what I might encounter. I also had modern conveniences such as air conditioning and a motorized truck. Even with all of my knowledge, I remember being awe struck by what I saw as I crossed the country. When I think about Bird, I am also struck by awe and admiration. Travel wasn’t easy in the mid-1800’s and there were a lot of risks in doing so. Imagine how valuable and entertaining her writing about her journey would be for readers of her time. If there was any doubt that women had the strength and fortitude to endure all of the challenges, Bird proved it was possible and was eventually inducted into the National Geographic Society as their first woman member. Mortensen introduces young readers to an incredible woman with an indomitable spirit. I hope that the spirit of adventure that resided in Bird will take root in the readers who are discovering her story for the first time. Look for a copy of the book at your local indie bookstore or at your community library. About the author: Lori Mortensen is the award-winning author of more than 100 books, including If Wendell Has a Walrus, Chicken Lily, and Mousequerade Ball, and over 500 stories and articles. Her most daring adventure? Driving from California to New York and back one summer with her family and their pop-up trailer. Just like Isabella, her family soaked up each exciting detail—from the Grand Canyon to the Appalachian Mountains, to fireworks in New York City on the Fourth of July. Today, Lori lives in Northern California. Visit her website at www.lorimortensen.com. About the illustrator: Kristy Caldwell lives in New York and has illustrated several books, including Flowers for Sarajevo. Her favorite way to travel is by boat. Visit her website at www.kristycaldwell.com. 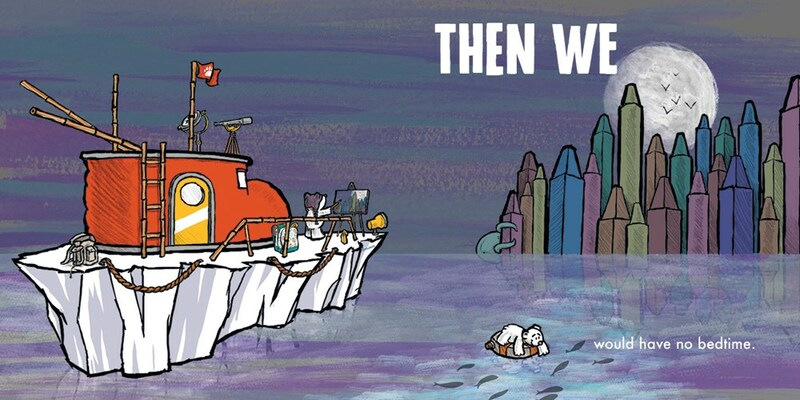 Two polar bear friends have a thrilling adventure as they imagine solutions to a variety of possible situations; their story will show readers how to create their own tales in response to the question "What if...?" in this ingenious picture book. "What if . . . we got lost far, far, far away, and couldn't find our way home? Then we would become the bravest explorers in the world." So begin the adventures of two intrepid polar bears. Traveling on a ship imagined from an iceberg, the bears encounter magnificent sights and scary situations. When a city made of crayons melts, the bears use pencils to create a beautiful gray world. When all the words in the universe disappear, the bears invent their own language. When something really big and really scary happens, they whistle and hold hands until it's not as big or scary anymore. And when they find their way back home, they're ready to imagine a thousand more possibilities. This companion title to the Boston Globe-Horn Book Honor Book One Day, The End. is ultimately a book about imagination, friendship, and finding possibilities in the smallest moments. In 2015 I was introduced to Rebecca Kai Dotlich and Fred Koehler and their wonderful book, ONE DAY, THE END. I remember opening the book and simply falling in love with the format and the possibilities for use as a writing mentor text. My first lesson with the book was with a group of kindergarteners. I loved that they could write their first shorter-than-ever stories and have so much fun writing. Back in January, I had a chance to read the companion book, WHAT IF…? THEN WE… and had that same feeling again. The feeling of falling in love with possibilities, which seemed even more appropriate this time around. At the end of January, I loaned out my F&G of WHAT IF…? THEN WE to a teacher. It has been a busy few weeks and I am excited to see what she and her students have done with the book. As I thought about sharing the book with students, I pondered how I would use it. Though I would not usually suggest reading only certain pages of the book, I considered the possibilities of starting with just the “What If” pages and having students come up with their own “Then We” pages. The format and style of the book perfectly lend themselves to creative exploration. I can see partners working together on both their own text and illustrations for the answers to “What If”. I suspect that there would be some equally fabulous suggestions to rival the actual “Then We” pages. Look for WHAT IF…? THEN WE… at you local indie bookstore and while you are at it, pick up a copy of ONE DAY, THE END. About the illustrator: Fred Koehler is an artist and storyteller whose real-life misadventures include sunken boats, shark encounters, and hurricanes. Whether free diving in the Gulf of Mexico or backpacking across Africa, Fred’s sense of adventure and awe of nature overflow into his characters’ stories. Thank you to Boyds Mills Press for offering one lucky reader a chance to win a copy of What If…? Then We… Please complete the Rafflecopter to enter the giveaway. Winners must have a US mailing address.